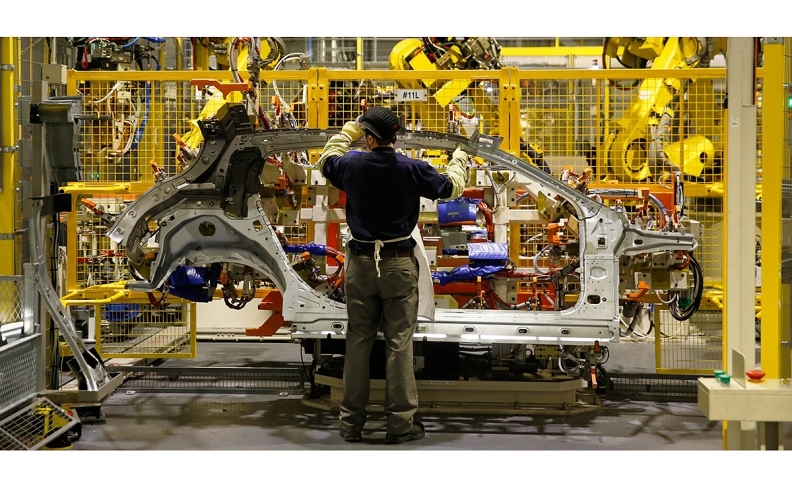 An employee handles a side panel of an Infiniti Q30 automobile on the production line at the Nissan Motor Co. plant in Sunderland, U.K.
Advanced high-strength steel, the newest, lightest steel invented, is aiming to hold off aluminum’s rise as the metal of choice for an auto industry in the midst of major changes. Lightweight aluminum has chipped away at steel’s use in vehicles as fuel efficiency standards have risen. Now steelmakers are fighting back. Their newest alloy could make its way to carmakers by 2021, with some available as early as next year, said Eric Petersen, vice president for research and innovation at AK Steel Holding Corp. The new steel will be marketed as stronger, less costly and almost as lightweight as aluminum at a time of upheaval for carmakers. The fuel standards are under attack, a trade war threatens to hike costs, and the auto industry is racing toward a future with electric cars that consumers insist go further and further on a single charge. For automakers, “the biggest bang for their buck is going to be in the powertrain and battery supply,” Petersen said. "Once you put your dollars there, you’re better off to go with a lower-cost solution in steel." Steel has long been the main choice for car parts and remains so today, making up about 55 percent of vehicles on average, compared with about 10 percent for aluminum. But the amount of aluminum in use has been rising over the last three to five years, said Abhay Vadhavkar, head of manufacturing, engineering and technology at the Center for Automotive Research. In 2014, for instance, Ford Motor Co. introduced a redesigned version of its F-150 pickup truck -- the top-selling vehicle in America -- with an aluminum body, part of a shift Vadhavkar sees as "pretty significant," given it was achieved among larger companies. Now, change is in the air once again. In August, President Donald Trump proposed holding fuel efficiency standards at 37 mpg, starting in 2020. That would do away with a requirement that they rise to 47 mpg by 2025, as called for by the Obama administration. The administration argument: Making vehicles lighter is costly, keeping consumers from buying newer, safer vehicles. At the same time, tariffs imposed by Trump on steel and aluminum threaten to boost automaker costs for materials from abroad. Both are seen as, perhaps, tipping the scales to lower costs from lower weight. “Some of this struggle is taking parts back from aluminum, but the bigger part of it is preventing more from going there that are currently steel,” said Kirk Reich, AK Steel’s chief operating officer. AK Steel’s research and innovation center in Middletown, Ohio, is like a miniaturized version of a steel mill. Inside, employees walk through the various stages of steel making on a much smaller scale, allowing scientists and engineers to test various new alloys. In the main office, away from all the laboratories, the company has a display of three different types of steel that can be used in automobiles: the traditional form now in use, a high-strength form and the advanced high-strength version, with each piece getting stronger, thinner and lighter. But the best is yet to come, according to Reich. “We’re already looking past this,” he said in an interview at the plant. “We’re exploring alloys in the lab that will be better" five to 15 years down the line. Still, there are more threats than just aluminum ahead, according to Matt DeLorenzo, senior managing director at Kelley Blue Book. “Talk to the magnesium- and carbon-fiber guys,” he said. DeLorenzo doesn’t see the equation changing materially moving forward. It’s more about what material best fits the needs for each individual component, he said. “You’re not going to see pure 100 percent aluminum vehicles, and the all-steel unit body is a thing of the past," according to DeLorenzo. "It isn’t an ‘either-or’ situation, it’s an ‘and’ situation. It just depends on where you’re going to use the material."